Home	/ Story of SVYM / (77) Time indeed flies! Time indeed flies. A few days ago, Dr Rajendra Prasad (RP as he is popularly called) sent me an email mentioning that he had received his promotion at JSS Hospital, Mysore (which he had joined recently) and was now a part of the faculty team. RP was my classmate and I first met him when I joined the medical college at Mysore in 1982. RP was a very studious person and we only knew each other as classmates. He hardly indulged in activities beyond the classroom or the library and he was known more for his deep academic interests than anything else. We lost contact after our graduation and I was surprised to hear from him in the middle of 1994. He sent me a letter from Kerala where he was working and expressed his intent to spend six months with us in the service of the indigenous tribals. I was very happy that RP, who had an MD in Internal Medicine, was keen on joining us, though for a very short time. 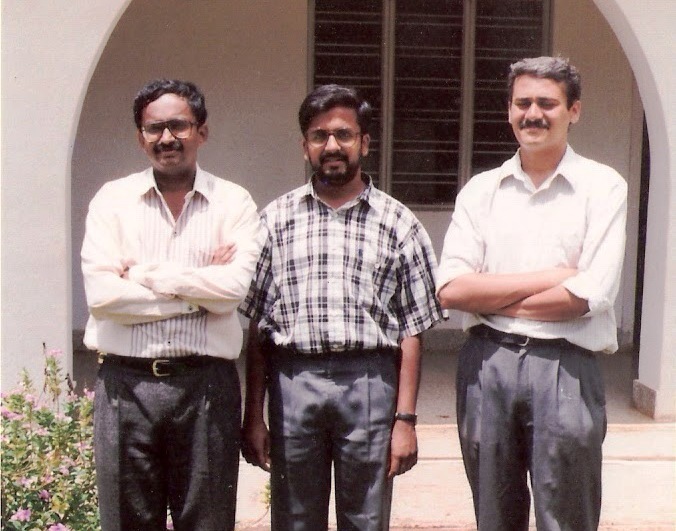 Vivek, Bindu and myself were at Kenchanahalli then and his presence would surely add to our medical skills. RP came in May 1994 and started his work with serious intent. He has a very pleasant demeanor and an uncanny sense of humour when he is with patients. He soon became very popular and started taking on more roles. His presence also gave the space and time for Bindu to take a break and try for her post graduation. She moved to Mysore and started preparing for her entrance exams. Six months flew by and RP did not even speak of leaving. It looked as though he was going to be here for a long time. RP soon took over the administration of the hospital as well and became its Chief Medical Officer. He soon got married to Shubha, another wonderful human being. His wedding was another adventure and a story that I will write about later. RP was the stable person that the hospital had lacked for long. His presence not only added to the medical competence, but also allowed Vivek and me the time and energy to focus on other organizational issues including the school at Hosahalli. Shivkumar had also joined after completing his Masters in Surgery and we were awaiting the arrival of Seetharam, Sridevi and M A Balasubramanya. Bindu soon returned with a specialization in Obstetrics and Gynaecology. It was indeed one of the best periods for SVYM…such wonderful doctors with deep-rooted convictions in rural service, Vivek with his obsession for perfection in our accounting and financial systems and I focusing on resource mobilization and networking. Mamatha was in full control of the tribal school and our work was getting better and better with each passing day. RP later moved on to Saragur when our new hospital was set up there. He and Shubha were blessed with two children – Abhishek and Anoop. Abhishek did us all proud when he topped his batch in 10th standard at VSOE this year by securing a perfect 10/10 CGPA. RP continued his wonderful work with us till December last year. He had been long talking about his love for teaching and for taking a break from the demanding medical practice at Saragur. He had earlier built the clinical part of our HIV/AIDS program at Saragur and Mysore. He needed a well-deserved break from the extraordinary work lasting 18 ½ years with SVYM. He joined the JSS Medical College and is now focusing his energies on training the next generation. Hopefully his good qualities, professionalism and humour will rub off on them too. RP, I salute you, your hard work and all that you did to build the medical work at SVYM.